The President of the United States of America visits the UK this week, and if he was any other leader it would be a simple exercise in international politics. But Donald Trump isn't just any leader. He's one of the most divisive presidents in US history. Protests are also planned in Scotland when he travels to play golf at his Trump Turnberry course. But Drew Liquerman, an American student who lives here in the UK, won't be among the demonstrators. As a member of the political group Republicans Overseas, he's a supporter of the President. "I'm excited to welcome the President of the United States," says Drew, who's 21. He believes Mr Trump's visit shows his respect for the UK, as his political career would get more of a boost from staying at home and campaigning in America. "It's the office of the President that's coming to the UK. He's not coming here for himself. "Donald Trump could do perfectly fine doing rallies in the US." He says his loyalty is to the position of president, not the person doing the job. "I would be happy to see Hillary Clinton if she was president visit the UK. I was happy when Obama did it." 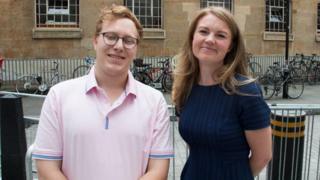 Evi Steyer, who's 26, is also an American living in the UK. She's planning to attend anti-Trump protests. She works for an asset management company and is a member of the Democratic Party. Evi voted for Hillary Clinton in 2016. Evi believes that "by hosting this president, the UK government is condoning his policies." "There comes a time when citizens and governments around the world have to draw a line in the sand," she says. For Evi, problems on the US borders - such as young children being separated from their families - is one of her key concerns about the US administration. She says they have "turned a blind eye" to the situation. 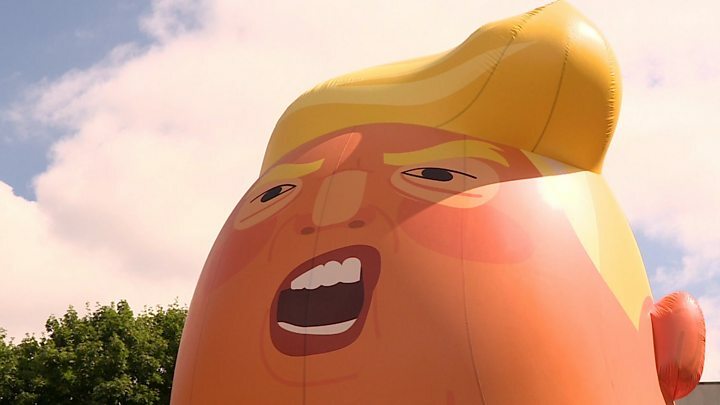 Evi is also excited to see the planned "Trump baby" blimp which is due to fly over London and Scotland when he visits. "I think it's funny. If a balloon flying over London makes people laugh, I think that's absolutely worth it," she says. Donald Trump's visit to the UK is his first as president of the United States. Unlike visits from previous presidents, he won't be spending much time in London. Mr Trump is meeting the US Ambassador at Winfield House after arriving and then head to Blenheim Palace in Oxfordshire. Then, to rest up from meetings and dinners, he'll head to Scotland to play golf.